Jo Gregory took on this challenge. 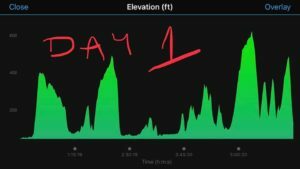 Her daily times were: (Day 1) 06:14:49 (95) (Day 2) 06:56:36 (91) (Day 3) 07:28:50 (104) with a total time of 20:40:15 and 80th overall. Awesone running Jo, Well done! 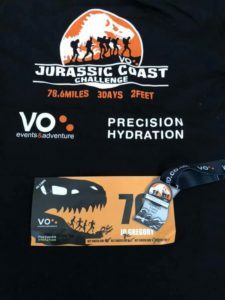 Last Thursday, I travelled down to Weymouth Dorset, to take part in the 3 day Jurassic Coast challenge! Sorry it’s taken me a few days to post anything but just thought I would share a few things about the trip! technically a large fib, the medal says 78.6 I clocked 84 on the nose! 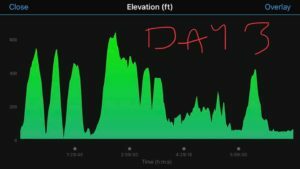  no I didn’t get lost, each day is longer than a marathon! Was it what I expected? yes and more, stunning indescribable coastlines and views day 3, will I ever run Chesil beach again? NO!! It’s shingle, need I say more?? I thought I knew hills from living most of my life in Derbyshire, WRONG!! 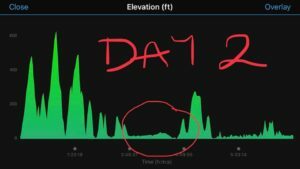 I’ve included the elevation for each day, note the circled area day two, that’s roughly 3 miles of shingle beach sandwiched in the middle!! Learned a few lessons over the days and made a great new running friend Alice! !